Cytogenix Taraxatone-New Formula On Sale! Extreme Muscle Definition Agent. Sheds excess body water fast. Designed for extreme muscle definition. Scientifically engineered rapid-acting formula. Ingredients: Other Ingredients: Gelatin Capsule, (FD&C Blue No. 1, FD&C Red No. 3, FD&C Yellow No. 6, Titanium Dioxide, Gelatin), Microcrystalline Cellulose, Magnesium Stearate, Silica. Start taking Taraxatone 5 days out from when you want to see your competition-ready muscle definition. Take one serving (3 capsules) with a glass of water twice daily; one serving in the morning and the second serving in the afternoon or evening. Increase your water intake during the first 3 days of using Taraxatone. For the last 2 days of using Taraxatone, significantly reduce your water intake to achieve peak muscle definition. Taraxatone should be taken for a maximum of 5 consecutive days, after which you should take 7 days off before starting another 5-day cycle. 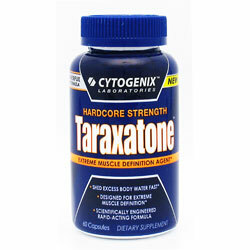 For best results, use Taraxatone in combination with an intense exercise and nutrition program. Read the entire label before use. Due to potency of this product, do not exceed 6 capsules in a 24-hour period.